Anti-Israel Protest vs Pro-Israel: a look back at July & August (pics & vids) | the "silent" majority no more! “There is nothing wrong with your television. 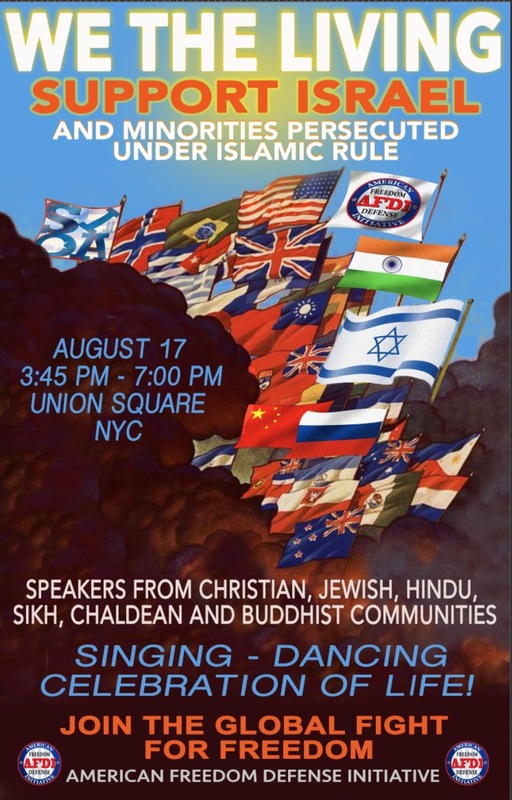 Do not attempt to adjust the picture.” Then, on August 17th, the Pamela Geller/Robert Spencer Rally , “Support For Israel and Religious Minorities” was held in Union Square- NYC. Even though we are walk in the shadow of Global Horrors, I left feeling energized by such a wonderful, spirited community. “For the first time, defenders of Israel and representatives of minorities persecuted by Islamic jihadists from around the world gathered together to stand for life and for freedom. Finally, the truth. Playlist of 15 great videos. Wonderful speakers gave support to Israel and to other victims of devout Islamists. We heard from the victims. We heard their warnings. Concern for those who fear for their lives 24/7 rang through the air. Cries and pleas ignored by the media. They can’t handle the truth. So they ignore it. We sang of Hope, Hatikva, of Yerushalim. A crowd favorite was , “Hashem Melech, Hashem Malach“, The Lord is King! It was a fabulous rally. Perhaps “new blood”, like Ari Lesser, will expose the media lies and propaganda with his hip-hop lyrics (which you can enjoy in the video playlist above) His lyrics smartly meet the challenge for the Next Generation. A great day for freedom lovers. Inspired. Our counter protests grow. August 1, 2014. Columbus Circle. NYC. Community Organizers prop-up these Muslim protests. Soc/Commie/Progs working behind-the-scenes to kill Western Civilization one protest-at-a-time. Fools and Tools. They. Never. Stop. Slideshow August 1st PRO-Israel COUNTER PROTEST: Emotions ran deep from those who came out to support Israel in the midst of another anti-Israel hate-fest. They hung in there, even though the police kept moving them from corner to corner. Slideshow August 1st -Anti-Israel Rally – Columbus Circle. Offensive signs filled with LIES; accusing Israel of ‘genocide’, of being Nazis. Death to Israel chants. Fists pumped in the air. Angry. Hateful. No call for peace. Not real peace. Not from these professional agitators. The leftist agitprop of genocidal hatred rang through the air, “Stop the killing. Stop the Hate”. Pleas meant to mislead the gullible press who choose to ignore the Nazi-like fists pounding over-head. The heart-felt pain of one woman who came to support Israel . This next rally was a “Takbir-fest”, in July. July 17 , 2014 – Times Square-Pumping fists. Screaming. Yelling. Chants-of-Hate. To be Free from Fear. Free Of Islam. Free from Tyranny. From brutal, murderous Savages. That would be REAL Peace. All the isms want ‘peace’. Communism, fascism, islamism etc.Their peace where everybody agrees with their philosophy/religion and always does what they are told. Non-conformists are of course severely punished or murdered. The battle for peace continues as we fight to stop the Media lies and distortions. Never Again means Never Again…. … evil WILL continue to thrive in this world until people make a conscious, deliberate, decision and effort to face it, grab it by the horns and and defeat it. Coming Soon to the Metropolitan Opera – NYC. Opening Night of the Metropolitan Opera House season. Stop Terrorism and Genocidal HATE. The Met is scheduled to present the anti-Semitic and pro-terrorist opera, “The Death of Klinghoffer”, which tells the story of the PLO murder of an elderly Jewish man in 1985. 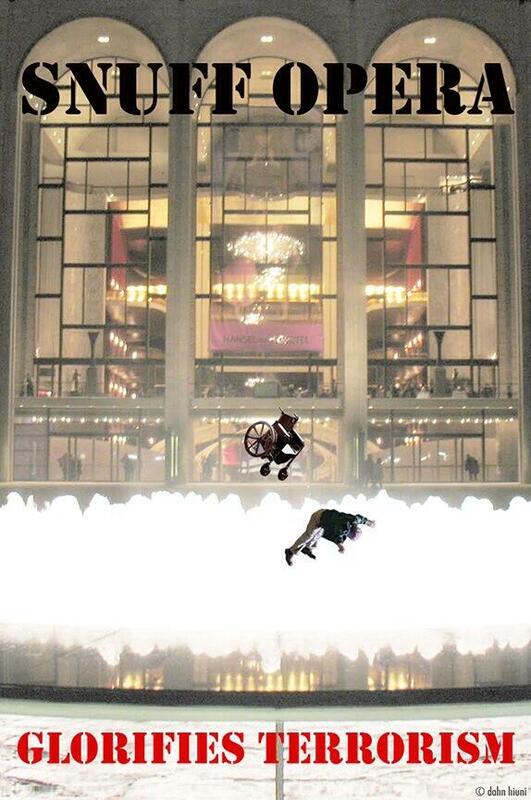 To date, Met director Peter Gelb has refused to cancel the opera despite strong opposition. All who object to terror should call Peter Gelb at 212-799-3100 x 2891 to insist that he cancel the opera. Plan to be at Lincoln Center on the 22nd. AND NEW ADS are coming to the NY Subways this September from AFDI (American Freedom Defense Initiative) to Fight the Media Blackout on the Truth about Jihad and Islam. Thanks to Pamela Geller and Robert Spencer, AFDI (American Freedom Defense Initiative) will have these truthful ads soon on NYC streets — at Columbus Circle! Wishing won’t do anything. Complaining does nothing but delight our enemies. Confrontation is the only way to deal with it. Stand Up. Speak Out. Fight Back! This entry was posted in current events and tagged AFDI, afsi, anti israel, columbus circle, islam, jihadis, muslim, pamela geller, pro israel, robert spencer, terrorism, union square. Bookmark the permalink.